No-one can help but adore Mori Lee dresses and once you have taken a closer look at the collection, you will understand why. Each dress is crafted to perfection down to the finest of details, with style and elegance finding themselves in absolute design harmony. With the design of clothes playing an integral role throughout her life, Madeline Gardner founded Mori Lee over 17 years ago. Her love for making ladies look and feel beautiful lies at the centre of her design philosophy, and it is because these wedding dresses achieve this without any exception that McElhinneys is proud to provide our customers with an exclusive collection of Mori Lee dresses in Ireland. This stellar range is marked by its originality and finds inspiration in the traditional. The attention to detail with each of these dresses elevates them to works of art - the personal touch added by the likes of beadwork and Swarovski crystals are just some of the elements that make them unmistakably unique. The collection also features elegant draping, embroidery, ruched fabric and lace details along with luxurious fabrics and lines that both refine and accentuate the female form. In some dresses, gathers of fabric are brought together by intricate bead details, while button up and ribbon backs provide design cues that epitomise traditional grace. From figure hugging bodices and graceful flowing fabric, brides who are after timeless elegance will find it right here. Mori Lee dresses also have something available for every body type and a range of different sizes, with the Julietta collection specifically catering for fuller figures by making use of classic silhouettes and flattering necklines. 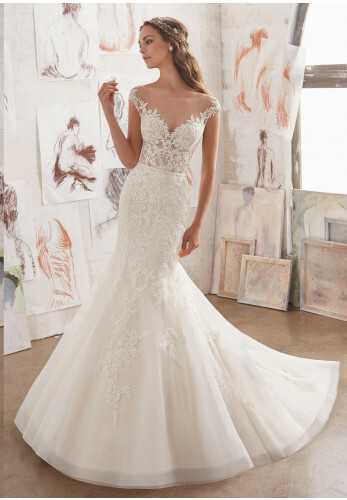 As it isn’t possible for us to display our entire collection of Mori Lee dresses online, we invite you to request an appointment or visit us in store for a shopping experience that will set a new standard in terms of the available selection and customer service. Our fitting rooms also grant you with the utmost privacy, giving you a taste of the same regal feeling you will get when your wedding gown selection is made from one of our Mori Lee dresses.